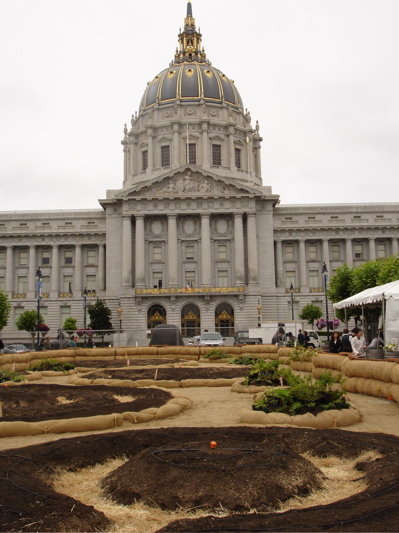 It’s pretty amazing to witness the transformation from grass to edible landscape over at the Civic Center. 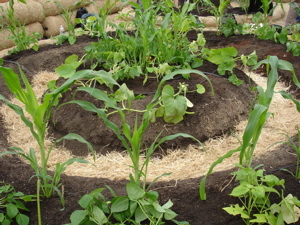 They’ve torn out the lawn, carted it away, and designed these gorgeous circular beds. Saturday, July 11th was planting day and what a wonderful day! These plants are putting down roots in the same spot where the World War II Civic Center Victory Garden sat. At one point 40% of the produce consumed in the US was grown in Victory Gardens. We can do it again! Victory Gardens 2008 + partnered with Slow Food Nation and City Slicker Farms to create this garden. 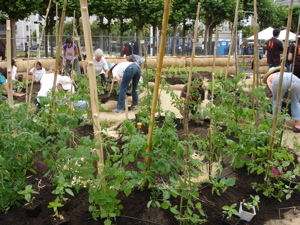 On September 21st the garden will be harvested and the harvest donated to the San Francisco Food Bank. It was a great day and felt historic. This movement has been going on for awhile now, but it’s been pretty easy to ignore for those who don’t pay attention to such things. It’s pretty hard to miss now! This is a start, but I wish the garden could be permanent. At the height of planting. This entry was posted in community, food justice, food news, food sustainability. Bookmark the permalink. Post a comment or leave a trackback: Trackback URL. THAT is SOOOOO pissa!!! I love it!!! What a great idea!! !